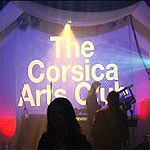 Corsica Studios is an independent arts organisation that sets up and develops creative spaces in areas of London. Here you can enjoy a variety of music nights, the night gallery and much more. Do you work at Corsica Studios? What did you think of Corsica Studios? What a loveable dump! Thoroughly enjoyed the venue, the staff were ace and the drinks were exactly the right price. Proper place for a proper stomp. Guy night tonight without advertise it. Music was not I was expecting it to be. Great music, good-looking people, decent sound system. Only issue is the lay out, a little awkward, trying to get outside through the middle of a crowd. Situated in a deserted street round the back of Elephant & Castle’s forlorn shopping centre, Corsica Studios is arguably the capital’s premier clubbing spot in terms of intimacy, cutting edge electronic music and a laidback vibe. The two-roomed venue (300 capacity room one, 150 room two) is housed in two railway arches and is run by an arts organization that converts spaces into creative spaces. So bar and cloakroom takings go towards wholesome London regeneration rather than fat cats’ pockets. Perhaps because Corsica Studios is set in railway arches, it feels more like a warehouse or studio than formal club, and is therefore somehow less uptight. The fact it’s off the beaten track in unfashionable south London means it’s frequented by people who know their music and have made a mini-pilgrimage of sorts, as Elephant & Castle isn’t the sort of place that captures passing trade. The smoking courtyard is always entertaining in terms of random chats, silent discos, and couples from the adjacent Latin club bumping into wide-eyed ravers. Corsica Studios is one of the laboratories where London’s reputation as a bastion of innovative electronic music has been incubated. Expect anything from house, techno and bass, and mesmerizing mixtures of all three (aka post-dubstep). Regular nights include UK garage throwback rave THEM, Bill Brewster's (DJ History, Last Night A DJ Saved My Life) superior house and disco party Lowlife, and genre-blurring Trouble Vision. Is reasonably priced unlike the £5 a beer in many super-clubs. Continental beers dominate including Stella, Budvar, Peroni (£3.50), and Modelo (£3.75). Spirit and mixers are £3.50 or £5.50 a double, a glass of vino is £3.50, while shots (sambuca, tequila, Jagermeister) are £3. Despite the state’s attempt to regulate ‘fun’ through the smoking ban, Corsica Studios is never anything less than friendly, wicked and wild.